We’ve evolved as mankind and gone are those days when caves were our only accommodation and wood and stone were our only tools. So why do some of us still choose to stick to the primitive methods of washing clothes? That’s a question I’ll leave you to ponder later; right now, let’s talk about those who do not want to stick to it. That means you: the readers, who are either willing to upgrade their washing machines or looking for the top rated washing machines on the market. Now, if you’re someone like me, you dislike the idea of spending your hard-earned cash behind a washing machine that has features that you may never use again. And you absolutely hate the idea of getting ripped off by that shady deal and end up buying a substandard product when the only thing you wanted to do was to upgrade it. Previously, you could find only a single type of machine whereas several varieties are available in the stores now. With so many choices and so little time to look them up, you might end up resorting to the sales pitch of the salesmen to make your buying decisions. To make the whole process easier for you and help you wade through the hundreds of options, we, at Stuffoholics, investigated the market and come up with our Top 10 Best Washing Machine list. The internet is a great resource to check the features as well as the user experience of different types of products. But there are some con artists who are into making quick cash by deceiving people with fake reviews. They are also often sponsored by product manufacturers to promote their products such a deceitful way. 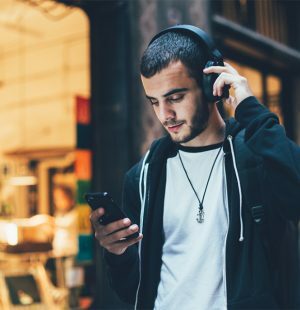 This makes people wonder how one can get reliable information regarding product use online that would help them make the right buying decision. Also, not everybody can review a product without having certain qualifications that make them well-suited to test the said product. Considering these inconveniences, Stuffoholics was launched about five years ago to test and review a wide range of products from different brands and share the real user experience with the audience. Our years of effort and sincerity in providing people with genuine and reliable product information and reviews have allowed Stuffoholics to be a household name in the vast world of internet and we are determined to do our best as long as we keep breathing. Over the past five years, my team and I have personally used around 55 washing machines of different types and makes from different brands with different features. We also engaged a team of volunteers in our effort consisting of people from all walks of life, including housewives and owners of self-service laundries to get their valued feedback. Then we listed down the top 21 washers that were really satisfactory when it came to their overall performance. We did so by comparing their features, capabilities, programmability, prices, ease of use, and a lot more. Then we went online and spent over 54 hours going through the reliable reviews and real-life user experience to see what their comments were on these washers. After our intensive research, we reduced the list from Top 21 to Top 10 Washing Machines that your money can buy. Our research was thorough, time-consuming and expensive. We didn’t want to compromise on the quality of our reviews so that we can bring you the best, unbiased review to help you make your buying decision easier. Front-loading machines tumble clothes in an up and down motion which is similar to hand washing. Gentle on Clothes: These machines don’t cause wear and tear on clothes because of following washing way similar to handwashing. Difficult to Add Laundry during a Cycle: Most front-loaders lock during a washing cycle to prevent water overflow, prohibiting the addition of last-minute laundry. Water Saving: Front-loaders use around 13 gallons of water per load. Higher Purchase Price: These machines have a higher purchase price in the United States. Detergent Saving: Front loaders must use low-sudsing detergents which are specially formulated and also marked as “HE”. These washers use less water and so need very less detergent. Higher Repair Cost: Front loaders have a higher repair cost because of many extra features and optional wash cycles. Energy Saving: These machines are more energy efficient and thus use less energy to heat water. Comfortable to Load or Unload: Front loaders require bending to load or unload. You can buy support boxes to raise the washer opening to waist level. These machines are easier to use for people with wheelchairs. Less Space Utilization: These machines can be placed with a dryer in small areas. Top loader washing machines usually use a central agitator with paddles to move clothes briskly in a washing circle. Easy to Load: You can easily load a top loader washing machine. Wear and Tear in Clothing: Top loaders cause more wear and tear in clothes because of using central agitator with paddles to move clothes. Easy to Add Laundry During a Cycle: You can easily add items throughout the washing cycle. Higher Water Usage: Top loader washers use 30 to 45 gallons of water per load. Lower Purchase Price: You can buy top loaders without breaking the bank. Requires More Detergent: You will need more detergent to wash clothes because of using more water in top loaders. Higher Life Expectancy: A standard top loader has an average life expectancy of 14 years. Less Energy Efficient: You will require more energy to wash clothes as these machines use more water and detergent during washing. Lower Repair Cost: Standard top loaders has lower repair cost. Difficult to Unload: You will feel difficult to unload these machines if you are of short height. Needs More Space: You will have to place top loader washing machines side by side with a dryer unless you have bought a compact, smaller washer/dryer combo. A spindle placed in the middle of the wash drum of an automatic washer is an agitator. Agitator moves clothes through the water and removes dirt from them. The agitator’s motion varies depending on the wash mode. A delicate wash cycle will be gentler than a standard wash cycle. It is equipped with vanes or fins that twist and turn during the wash cycle. Quick Removal of Dirt: Twisting and turning of agitators remove dirt quickly and completely. Wear and Tear in Clothing: Agitator washing machines cause more wear and tear in clothes during standard wash cycles. Easy to Add Laundry During a Cycle: Top-loading agitator machines will open during the fill, wash or rinse cycle. Then you can add more items. Higher Water Usage: Top-loading agitator washing machines use more than 40 gallons of water per wash.
No Additional Room to Open the Door: The top-loader agitators don’t need any additional room to open the door because you need to open on the topside of the machine. Increased Drying Time: Agitator machines only spin around 600 RPM and thus don’t remove much water from the wash. So your clothes’ drying time will be increased. A gentle revolving hub which replaces the agitator in many washers is the impeller or pulsator. As the impeller rotates, the blades of a pulsator generate unstable current in the water inside the washer. This current rotates the clothes without causing any physical contact of the impeller with the fabric. Aside from this, the impeller doesn’t take up a lot of space inside the drum, making impeller washing machines much easier to load than the agitator types. Gentle on Clothes: These machines are gentle on clothes. Cannot Add Laundry During a Cycle: Front-loader impeller machines cannot be opened after the machine is started or the water will spill out. So, you cannot add laundry during a washing cycle. Easier to Load: The impeller takes less space in the center of the drum, So you can easily load impeller machines. Need Additional Room to Open the Door: Front-loading impeller washing machines need additional space because the door is on the front side of the machine and you will open it in the outward direction. Water Saving: Front-loading impeller washing machines use only 20 to 25 gallons of water. Energy Saving: Front-loading impeller washing machines save energy because of using less water. Decreased Drying Time: Impeller machines can spin at 1,000 to 1,600 RPM removing more water from the wash and thus your clothes’ drying time will be decreased. A twin tub/semi-automatic washing machine has two tubs: one tub for washing and the other for spinning the clothes to dry. You have to move the clothes from the washing tub to the spinning tub after the washing cycle has finished. Water Saving: These machines use less water. Even you can reuse the water for more than one cycle of washing. Manual Intervention: You have to move the clothes from the washing tub to the spinning tub manually. You have to remove the electrical connection during moving clothes from one tub to another, if wiring is not properly earthed. Decreased Drying Time: The spin tub in the machine spins the clothes much drier. Requires More Space: Needs more space because the machine is larger than the fully automatic washers. 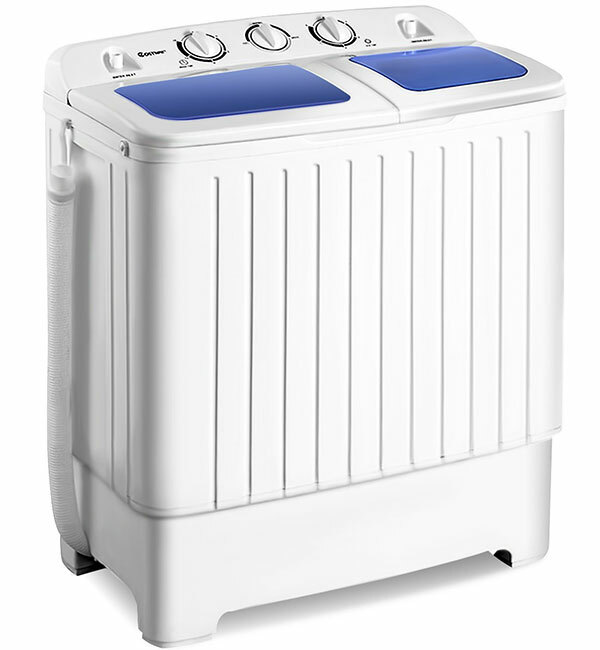 Time Saving: Twin tub machines can wash your clothes much faster than standard machines. Moveable: You can easily move it to any location. These washing machines are of two types: front loading and top loading. Full Automatic Operation: Set the needed functions and the machine will work automatically and completes the whole cycle from washing to drying. Running Flow of Water: Top loaders need running flow of water to complete the cycle automatically. 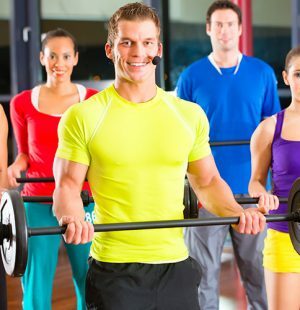 Lighter Weight: Top loaders are lighter in weight. Higher Initial Cost: Front loaders have higher initial cost. Cheaper Price: Top loaders are cheaper in price. Slower Wash Cycle: Front loaders have slower wash cycles but some have a quick setting option. Wide Range of Variety: Top loaders have a wide range of features and models. Unmovable: Front loaders cannot be moved, require a fixed place. Water Saving: Front loaders use less water. Thus, your clothes’ drying time will be decreased. Better Washing Quality: Front loaders washing quality is better. More Cycle Settings: Front loaders have more cycle settings- some have a heating element for extra hot wash.
Hand-crank, non-electric machines have the following merits and demerits. Electricity Saving: You can save electricity because these are non-electric. Less Durability: The building material is not durable. Portable: These machines are portable because of their lightweight. Less Washing Capacity: Have washing capacity of only 25 to 40% of the regular washing machines. Smaller Space Occupying: The washers require very small space to place. Commercial washing machines are used for industrial purposes by hotels and other businesses. Like everything else in life, you have to be cautious about what you buy; and when it comes to buying top rated washing machines, things get really complicated with all their features and types. 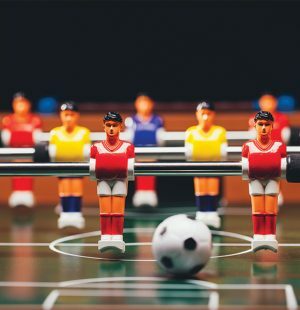 It’s hard to tell the differences between the competing brands and their products. When buying a washing machine, your primary focus should be its wash load capacity. It ascertains the machine’s capacity to handle load in a single wash. You need to be able to utilize the machine’s full load capacity to conserve the energy optimally. Machines with an 11 lbs capacity will be best suited if you have a family of two. But if you have a bigger family, up to five, you should consider going for the ones with a capacity of 15 lbs. 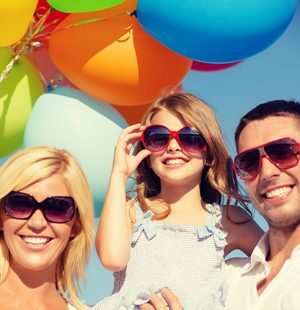 For bigger families, one should be inclined to go for anything higher than 15 lbs. The washing machine spinning speed indicates at what speed it spins the fabrics to take away the water from them during the washing and drying process. Cotton clothes require 1000 to 1800 rpm spin speed which is higher of while the synthetics and more delicate clothes require a lower spin speed. Make sure to purchase the washing machine that allows you to change your spin speeds. Keep an eye out on the several programs that come with your washing machine. There are some programs that are common among all top rated washing machines, like quick wash, wool wash, silk-wash, hand wash and the like. Then there are the ones that have advanced programs like intensive wash, pre-wash, germ-free wash and extra rinse. Some modern machines even come with a Fuzzy Logic program where you only need to put in your clothes and the machine will do the rest. Then the built-in sensors will select the correct settings for the perfect wash. It is important to note the efficiency ratings of a washing machine when planning to buy one. The washing performance index should be very high, i.e. it should be able to efficiently wash your clothing for the minimal amount of water. Similarly, you should consider the Spin-Drying Index as well as the Energy Efficiency Index. When shopping online, look for the rating indexes for each of the products. These indexes are generally rated on a scale of A to G by the European Union Directives. You can check the EU Energy Labels on the product to determine the efficiency label when purchasing the product in person. Generally, a product with a good rating in all three indexes is given an AAA rating. This is the one you want if you want to reduce your running costs and your carbon footprint. Several temperatures are required for washing several types of clothes. Such as you can clean cotton clothes better at a high temperature whereas you cannot wash delicate clothes like silk at a higher temperature. Most washers offer three to four different wash temperature levels, such as 60 degrees or 90 degrees and the like. Look for the ones providing more choices. Water supply is absolutely essential for washing clothes. Some washing machines are directly connected to a plumbing system to supply water while others need water to be fed manually. However, most washers can take water which is suitable for soft wash and removing stain well. You’d want to get one of these as they tend to save energy. Any large household appliances with mechanical parts are bound to get noisy. When choosing your washing machine, you should also consider how loud its operation would be. And if you have a baby at home that just does not want to go to sleep, you wouldn’t want to wake her/him up with your washer’s sound. The sound or noise is measured in decibels. You’ll find categories like: 40 to 50 dB, 50 to 60 dB, less than 40 dB or more than 60 dB of noise. Nowadays most of the washing machines out there are the 50 to 60 dB type, which has the same noise level created by a doorbell. There are some hi-tech features which might sound appealing, like the Auto-dispense, Built-in sink or faucet, Soak Cycles or the Auto Temp. Features like control, delay wash, end cycle signal, and the like can influence your buying decisions as well. However, it’s worth keeping in mind that the more the special features, the higher the price. We have spent more than five years researching various types of washing machines. We tested around 55 washers some of which are not available in the market anymore for various reasons, one of them being the manufacturers stopped producing them. Of the 55 washing machines, we narrowed down our testing to 21 washing machines across different brands and price ranges to determine the top 10 products. Our team of volunteers was also very helpful in determining the quality of each of those washers. Without them, we couldn’t prepare this top rated washing machines list since buying and checking so many washers individually were impossible for us. We measured the performance of the each of the washing machines following a certain procedure that we usually do when reviewing other products. We analyzed every product in terms of Capacity and Controls, Build Quality, Weight & Dimensions, Features, Programmability, Ease of use and Other Factors like Certifications, Rating, Reviews, Rating Frequency, Price, Warranty, etc. We categorized 52 features that make for a good washing machine and then checked to see which washers had which features. Each of these factors makes a difference in the overall performance and even in the lifetime of a washer. If, for instance, a washing machine has all the features you need but is too much noisy that might scare your toddler, you would look for another option. So every feature that our research has is worth to consider to make an informed buying decision. Then we assembled another team with a few members whose sole purpose was to check what other online users had to say about the washers we shortlisted. As we had expected earlier, other users were also quite happy about the washers we shortlisted and only then we finalized our top 10 picks. Our deep analysis of these factors is unlike any other market research available, and we are proud of the discoveries we have been able to make. Through this rigorous testing procedure, we have been able to determine some of the top rated washing machines on the market today. We have analyzed 52 of the most important features available on a top rated washing machine. Then we compiled all of this research into an in-depth report that we developed our top 10 washing machine reviews from. If you’re not entirely convinced by this review and want to check out some hard data, we’ll be leaving our research report here for you. We suggest that you read our top 10 best washing machines list first and then dig into all of the particulars included to follow along better. This is the best place for you to be able to make direct comparisons between all of the washing machines we studied. Before reviewing Haier HLP21N, let us explain why this washer took the first place on our best washing machine list. One of the most popular washers on sale right now, the Haier HLP21N is a durable & professional machine that will deliver high quality washes long after many other machines’ performances will be dropping. An all time favorite, suitable for any occasion. Though it didn’t have the highest number of positive features that make for a good washing machine, it had a nice combination of the most important ones that was suitable for the average user. It had over 1100 reviews on Amazon when we last checked and the latest 10 reviews were given within 22 days, the previous 10 reviews in 5 and the 10 even before that in 5 days. That meant this product was being sold very fast which meant it was a very popular item. There are many portable agitator washers you can buy without spending more than $100 while Haier HLP21N costs over $300. So what makes it worth the extra cost? First, it’s made of stainless steel which gives it durability while its cheaper counterparts are made of plastic. Second, Impeller/Pulsator washers save you electricity and water, which makes up for the extra cost over time. Also, they are effective in drying clothes, so you don’t have to buy a dryer separately for this purpose. Of our Top 10 washers, only this one has wheels that make it quite easy to move around, making it perfect for outdoor use. 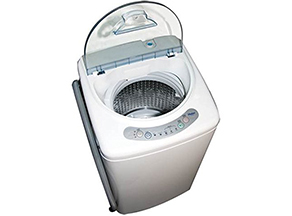 This pulsator washer has a 6-pound washing capacity which is perfect for a small family. Being a stainless-steel unit, it is sturdy and we got the proof when we were able to use it for years without any issues. It approximately measures at 17-1/4 by 17-3/5 by 30 inches and weighs 43 lbs, making it easily portable like most of the washers in our list. It has timers for both the wash cycle and spin cycle so that the user doesn’t have to do it manually. It also has 3 water levels with 3 wash cycles, namely heavy, quick and spin-only. However, we noticed that the settings were not so much effective, at least not what we had expected. As the only impeller washer in our Top 10 Washers list, it is much gentler on clothes than its agitator counterparts, so your clothes will last longer with this machine. This high efficiency (HE) washer can save water and energy because it is WaterSense and EnergyGuide certified. There are very few washers in our list that can be connected to a kitchen sink for easy water filling, Haier HLP21N being one of them. Another amazing feature that was very helpful for us was its cycle end signal. With this, the user never needs to waste their time waiting for the wash cycle to end. 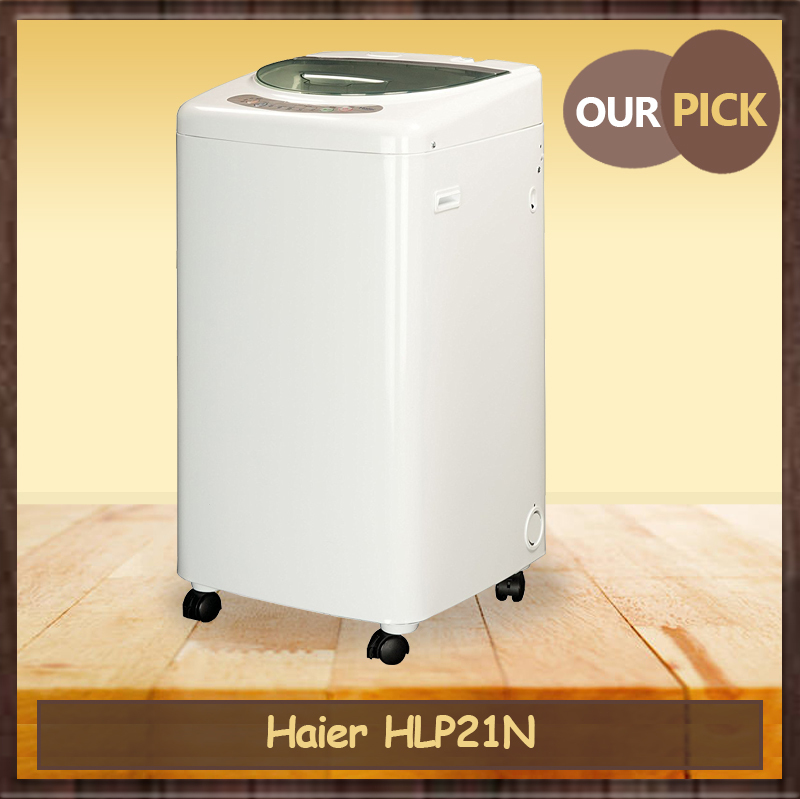 Haier HLP21N makes very little noise, so those with children or aged people in the family might find it very helpful. This is the only washer in our top rated washing machines list that comes with wheels for easy mobility, so you can use it both indoor and outdoor. As stated earlier, it comes in a $300 price range, which is actually not too high considering its features and performance. It also has a 1-year warranty period while our runner-up pick comes with none at all. This washing machine takes the lead in its category. Although it comes at a price, what you get in terms of its features and performance is simply extraordinary. There was little to no issues that we had to face in the years of using this machine and based on our positive experience with this unit, we would recommend it to anyone looking for a portable washer that will be worth every penny spent on it. Almost worth making it a joint winner, the Giantex washer gives the customer a brilliant low-price option. With a silent operation & a large capacity, this is certainly a washer for a practical family. This Giantex portable and compact washer also deserved to be on top of this list and it actually had way more reviews on Amazon than our top pick, though they both had the same rating (4.2). Since we couldn’t choose 2 different products as our top pick, we had to consider it as the runner up pick because as a top-load agitator washer it couldn’t offer the superb benefits that a pulsator/impeller washer could provide. It had lesser positive features since it came without any warranty or certifications and it was also made of Polypropylene instead of stainless steel, making it less durable. Moreover, it required assembly to be used after purchase that many novice users find troubling. This agitator washer’s wash capacity is 11 lbs and spin capacity is 6 lbs, which is actually more than our top pick. There is another smaller version that has a 10 lbs wash capacity with a 6 lbs spin capacity. 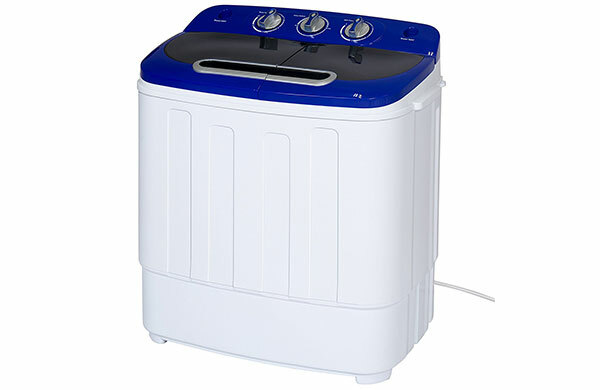 It has a powerful 1300 rpm motor that means better spin power for effective washing and drying. It is made of Polypropylene that is resistant to household chemicals like bleaches or detergents, though less durable than stainless steel. In case of programmability, this product lags behind our top pick. Although it has a wash cycle timer to make the washing task easier, there is no spin cycle timer. It also has no extra rinse cycle or soil level setting. Still, we found no problem in using this machine. 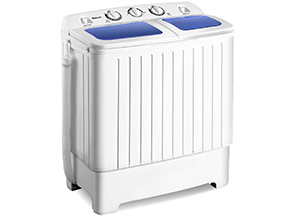 All we had to do was fill it with detergent and water and then set the timer for it to give a thorough wash.
Giantex Mini Twin Tub Washer has two different cycles – a soft cycle and a normal cycle, aside from the drain option. The wash cycle goes up to 15 minutes, though 12 minutes is enough for a lighter load. We could wash 5-6 large garments in one cycle easily, but never overload this since that might affect its functioning. It has two water inlets for filling water but its adaptor didn’t hook up with our kitchen sink. So we had to fill it manually. But the good thing is that it has a quiet operation and is easy to store since this is a portable washer. This is an affordable washer unit that comes under the $100 price range but there is no warranty, definitely a bit disappointing. Considering the features you get, its price is reasonable though you will miss some great features that our top pick comes with but at a much higher cost. However, it is still a great purchase considering you can wash large loads of clothes with this Twin Tub washer without breaking the bank. Kenmore Elite 41073 has so many advanced features that you could think that this washer has arrived from the future through a time machine. This is not only our advanced pick, but also the best front-loader washer as per our observations. Why We Choose this as Our Advanced Pick? The Kenmore Elite is a masterpiece of washing machines, providing you with an endless list of features including having a smartphone app to control the machine, this is for anyone who truly wants the best. It has a large wash capacity which is simply staggering and can easily accommodate large comforters. It also had the highest number of features among all the washers we had tested and listed that can hardly be found in other washers. 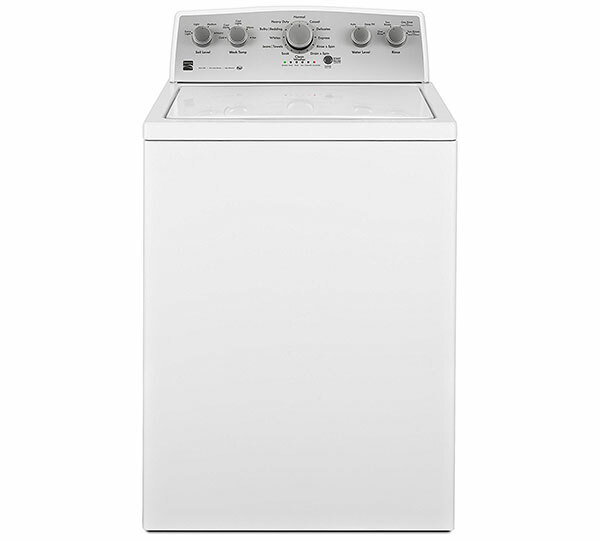 If you see our research report, you’ll find that another front-loader is in our Top 21 list, Maytag Maxima XL. Though it costs 3 times more than Kenmore Elite 41073 with a higher wash capacity, it doesn’t have so many features as Kenmore Elite 41073. That’s why it couldn’t take place in our Top 10 washer list. Also, Kenmore Elite had a much higher rating (4.2) than that of Maytag Maxima XLs (3.7), which meant users were happy about it. The most interesting fact about this washer is you can use it through your smartphone with an app. Of all the 55 washers we tested in the past 5 years, none of them had this feature except this one. So you can use it even when you’re not at home. It’s EnergyStar certified, which means it will keep your electric bills down with its energy efficiency. None of our Top 10 Washers is EnergyStar certified except this. And front loader washers usually use a lesser amount of water than their front-loader counterparts. When it’s about the number of reviews and rating frequency, this doesn’t have anything special that could catch our attention. But that doesn’t mean people are not interested in it. The matter of the fact is that such a heavy machine is not as much sold online as its portable and compact counterparts do. But we noticed that it was regularly being sold in stores as a popular product. Kenmore Elite 41073 has a huge wash capacity of 5.2 cu. ft. with 14 wash cycles, which was the highest among our researched washer units. It’s stackable and made of stainless steel, weighing 205 pounds. There is another smaller 4.5 cu. ft. version of this unit as well as a Smart 5.2 cu. ft. version available on Amazon. 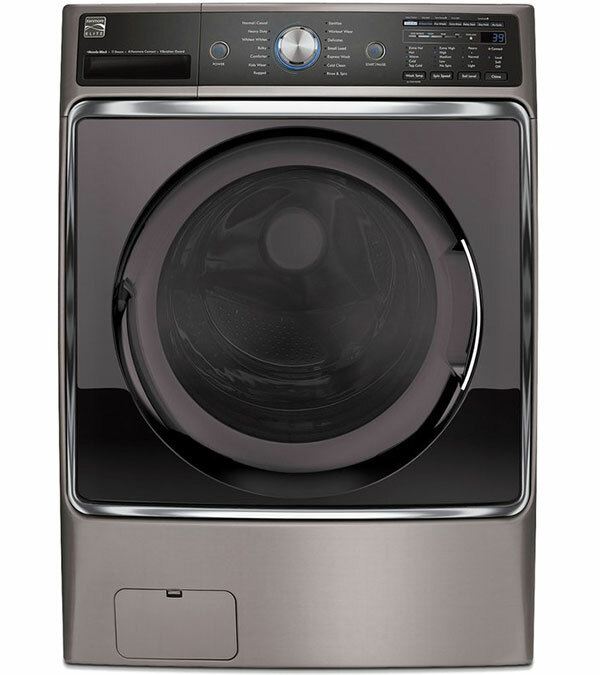 Kenmore Elite 41073 comes with an extra rinse cycle where fabrics are moved through a cycle of washing and draining. After that the washer is stopped, extra detergent is included and the cycle is repeated again with the warmest water temperature the fabrics can bear. Its 5 soil level settings help remove soil or dirt from clothes more effectively, and you can even control this washer with your smartphone or tablet with its Kenmore Smart Technology. There is no shortage of features in this unit. Its SteamTreat choice removes the stubborn stains which are set-in while the NSF-certified sanitization cycle applies the temperature of water which is high to kill 99.9% of bacteria in a quicker way. So we never had to use bleaches or other chemicals which are harsh. Also, the Kids Wear Cycle will be helpful for you to scrub out stubborn stains while rinsing the fabrics in a second cycle to clean the clothes. Aside from having active spray and active rinse facilities, its Accela Wash Technology can clean a full sized load in 29 minutes. Using this top-notch washer was quite easy for us due to its multiple controllers and our clothes always came out fluffier, softer and cleaner. It also kept the electricity bill low since it could dry even a full load of jeans within 20 minutes. But it does not have any cycle end signal, which was not expected from such a high-end machine. It comes with a 1-year warranty, which is actually not satisfactory considering its high price – a bit less than $1000; though this was much lesser than another front-load washer in our 21 Top Rated Washing Machines List – Maytag Maxima XL Front Load Steam Washer and Steam Dryer SET, costing around $2300. We believe it would be better if it had a longer warranty period. This is an advanced washer with excellent programmability and so the price is also on the higher side. Those looking for a feature-rich washing machine can go for it without any second thought, though it will come at a price. Overall, if you are not worried about the price factor, this is the best choice for you. Why We Choose this as Our Budget Pick? 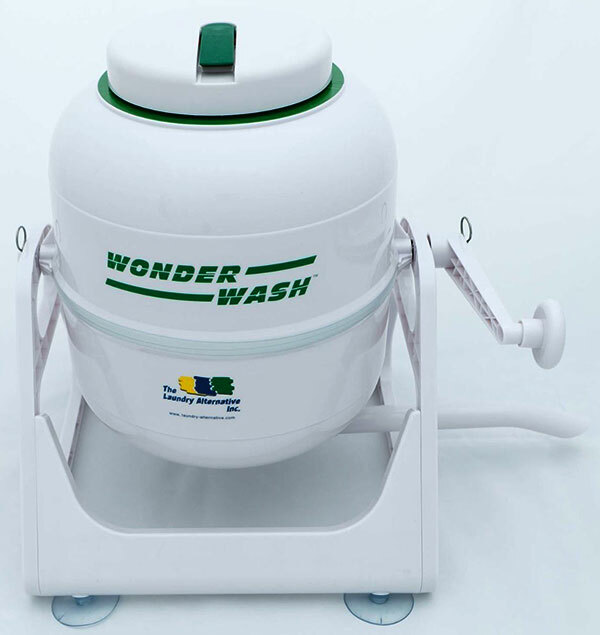 The Wonderwash does what you expect a budget washer to do, with a great price at just over $50, it gives a brilliant budget option for those in need of a washing machine. When choosing our budget pick, we focused on which one had the lowest price with the highest number of features and warranty. Two contenders at the $50 price range came in our mind after comparing our research report, namely The Laundry Alternative Wonderwash and Avalon Bay Ecowash. Though both had the same rating (3.8), the former had over 1100 reviews with 18 features while the latter had only 223 with 16 features. This huge gap meant Laundry Alternative Wonderwash was able to create a vibe in the industry. You don’t need electricity to operate this unit, which means you don’t have to worry about increased electricity bill at all. That takes another load off your budget. It also comes with a long 3-year warranty while even the feature-rich and pricey washers usually come with a bare 1-year warranty and sometimes, none at all (check our research report to compare). Laundry Alternative Wonderwash has a 5-pound wash capacity and in reality, we could use 5-6 clothes at one go. Don’t overload it and fill water half the way for better results. So it cannot take care of bulk laundry loads and not suitable for a large family. This mini washing machine lacks the programming features that are found in electronic washers. Since Laundry Alternative Wonderwash is a manual washer, it doesn’t contain so many unique features like other electronic washers on our top rated washing machines list. But as a hand-crank washer, it will save you water and energy and it’s also environmentally friendly. Also, Amazon offers Frustration-Free Packaging on this item, which is a plus point. For your info, there is no extra materials used in this recyclable packaging. It is quite easy to use – the user just has to put in water, clothes and a bit soap; tighten the lid, grab the handle and spin it about 1 revolution per second for around three minutes. When done, the user then has to depressurize the top and drain the water inside using the drain hose. We were not happy with its stands though; they were weak and flimsy, and many users complained about it coming off after 1-2 years of use. 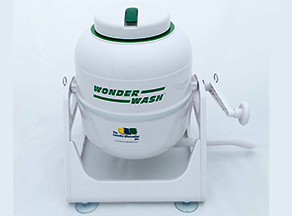 Laundry Alternative Wonderwash is a great washer in terms of its price and warranty. As stated above, there is a long 3-year warranty available for this unit and it can be afforded by anyone due to its low price. If you check our research report you will see even those washers that cost around $150 barely come with such a long warranty period. Based on our experience, we can say that there is no better choice than this for those who are in a budget since it requires no electricity to run and you have to pay a nominal price for this. Though it lacks a lot in terms of features and programmability, it will last long and your daily washing needs will surely be met by this manual washer if you’re single or there are a few members in your family. The Best Choice Washing Machine comes with some great features & is a brilliant machine, especially if space is a concern. With 8 lbs of wash capacity and 5 lbs of spin capacity, this twin tub washing machine has an amazing performance, sometimes better than a full-size washer, we must say. It’s made of durable plastic material and won’t shake much if plumbed in as a permanent washing machine. This Best Choice Washing Machine has 3 knob controls for wash, drain and spin cycles. From our experience, we’d suggest to not use a lot of laundry soap. Using an HE soap is best since it does not create too much suds and your washer will thank you for this. Another suggestion is you can add some soap and water first to the washer side, agitate it for a few seconds so that it mixes well, and then add your clothes. Also, if you leave water in the spin tub, mold growth could occur and the spinner could stop working as a result. Similar to other portable mini washers, it is quite easy to use. Weighing only 27 pounds, it can be moved from one place to another without much hassle. Though this could be made even more convenient through adding casters. It is the only UL certified product in our top rated washing machines list, which means it is very safe to use. In terms of warranty, it has only 4 weeks of warranty period that is somewhat frustrating considering many other washers in the same price range come with a longer warranty period. If we look into its features and functionality, the price which is a bit more than $100 seems reasonable after all. We hope the manufacturers will take some steps to increase the warranty period for customer satisfaction. Overall, Best Choice Washing Machine is a great washer with a great review frequency, which is a concrete proof that it is being sold on Amazon frequently and people are also reviewing it quite often. This washer/spinner combo could not take place in our top 4 picks since we noticed it did not have some advanced features that they come with (except the budget pick), but it is a great option for those who need a good quality standard washer for their daily laundry washing needs. One of the few countertop washing machines on the list, the Panda washer works brilliantly with a focus on lighter clothes, all for under $100. The manufacturing company itself said Panda 5.5 lbs Counter Top Washing machine is suitable for small loads as well as delicates, such as towels, socks, underwear, etc. Well, that was true though we tried washing jeans with it and it worked fine for two pairs in one cycle. The only thing to remember here is never try to overload this machine. It has a rotary knob timer that can be used for both wash and spin cycles. Its maximum wash cycle time is 10 minutes and for the spin cycle, it is 5 minutes. It is made of plastic and its transparent body allows the user to see the whole wash as well as the spin process quite clearly. Using this countertop washing machine is quite easy and simple. But the inlet hose it comes with was not a good one and ours broke within a few months, so we had to add water using a container. 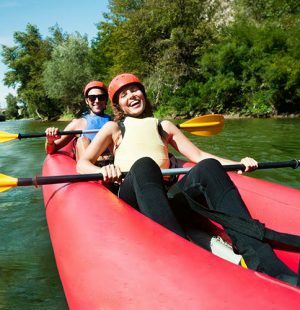 Other than that, it can be used outdoors as well as in small apartments, dorms or RVs without any hassle. Panda 5.5 lbs Counter Top washer comes with a 6-month warranty while its price range is under $100. Bearing in mind its features, programmability and build quality, the price is definitely reasonable. Again, we would appreciate if the manufacturers think about prolonging the warranty period to at least one year. Panda 5.5 lbs Counter Top washing machine is one of the highest reviewed washers in our top rated washing machines list though its rating is only 3.4 on Amazon. But we were actually quite happy with this unit and so we could not bother giving it a 4.2 rating. Though this is not the best compact washer out there, it is a great choice that can be tried by any small family. Save on water & price! Coming at a very affordable $49.99, the Avalon Bay Ecowash is an affordable, easy to use machine with a fantastically quick wash time. 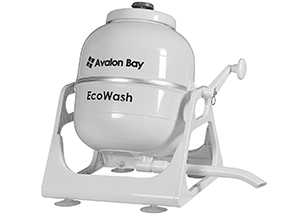 Avalon Bay Ecowash requires no electricity to run and can accommodate up to 5 lbs of laundry. 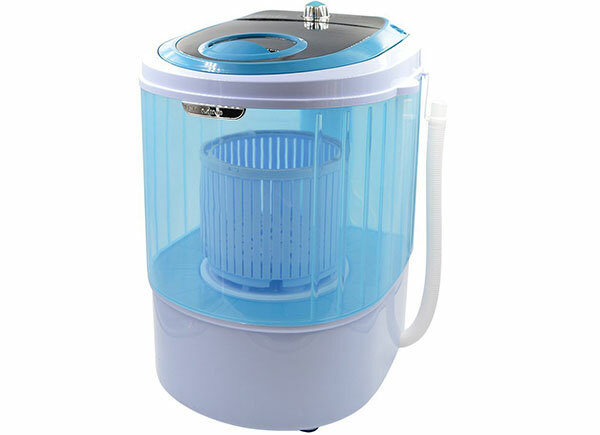 So similar to other mini washing machines in our list, it can be used for a small load. As a hand-crank, non-electric washer, there is no programmable feature in this washing machine. However, it uses a “Pressurized Cleaning” technology where a screw places the pressure and seals the body of the washer for effective cleaning. Using and assembling of Avalon Bay Ecowash is quite easy and you can even check some YouTube videos to see how to do it. After a few sessions, you will be accustomed to this unit and for the beginners, we would suggest them to use 2 quarts of water and 2-3 small clothes for washing and rinsing so that they don’t overload the machine and then get disappointed with the results. 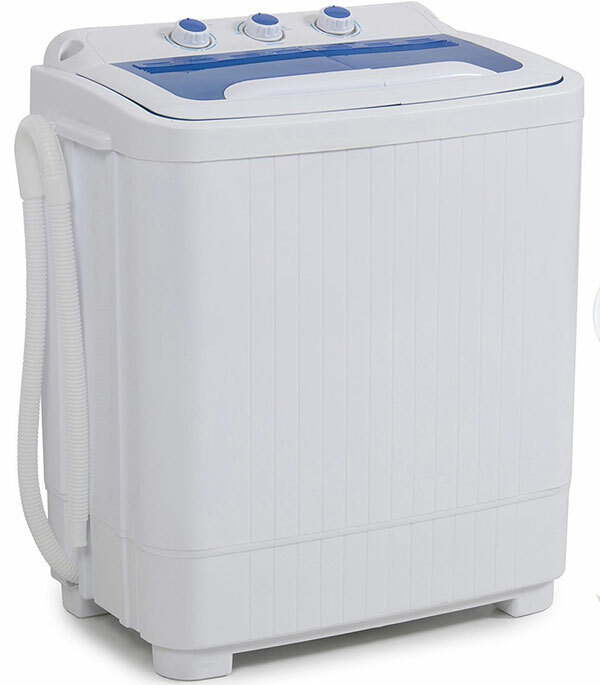 It can also be stored and carried to anywhere you want because this is a portable washer. In terms of pricing, you have to pay around $50 for this washer unit. But a disappointing factor is that the manufacturing company provides only a 30-day money back guarantee on this product. You already know there are two hand-powered washing machines in our top rated washing machines list in the same $50 price range. But while Laundry Alternative Wonderwash has a long warranty of 3 years, the manufacturers of Avalon Bay Ecowash back it up with just a 1-month long guarantee. So the former is obviously a more reliable option than the latter. 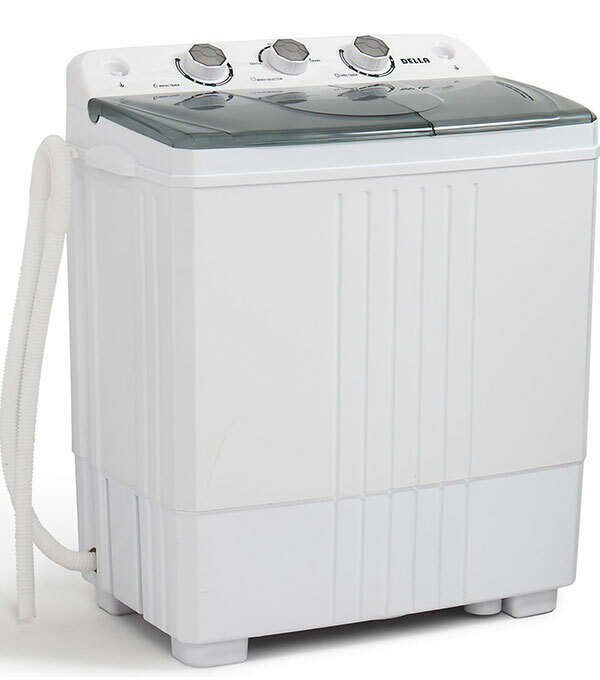 Other than that, this is another great budget-friendly washer for daily use. With DELLA being one for the most well-known names in the washing machine business, you know exactly what you’re going to get with the Compact portable washing machine, a very reliable option that will last for years. DELLA is a household name in the washing machine market and two of their washing machines can actually be found in our top 10 list, DELLA Small Compact Portable Washing Machine being one of them. Its wash capacity is 11 lbs and spinning capacity is 3.3 lbs, which is too small, requiring the user to use the spin cycle twice for one load. It can handle heavy sheets although our experience says you will get better results if you spin one sheet at a time. This electric washer has 3 rotary knobs – Wash Timer, Wash Selection and Spin Timer. There are two separate tubs for wash and spin cycles. If you go through our research report, you will see only our advanced pick and two Della washing machines come with built-in drain pumps, an excellent feature that allows you to drain out dirty water quite easily when compared to a gravity drain system. There is nothing complicated in using the DELLA Small Portable Washing Machine – the user just has to fill it with water, set the timer and wait for the machine to do its task. Carrying it is also quite easy though the package may look a bit bulky. It has a somewhat noisy operation but that won’t create any disruption in your daily living. It costs a little over $100 and its warranty period actually varies between the sellers. The one we tested came with a 1-year period and fortunately, we never had to contact the manufacturer for any issues. This portable washing machine had a great Amazon rating, 4.2 to be exact when our Stuffoholics team last checked. For your info, such a high rating was obtained by only our top 3 picks. This means the users were quite happy with its performance and so were we. Its stainless steel body makes it a durable product and so you won’t have to worry about replacing it anytime soon. Any person can give it a go to cater to their daily laundry washing needs and they will surely never be disappointed. Kenmore brings yet another brilliant household appliance, with the massive 4.2 cu ft capacity & 12 different wash cycles, the Kenmore 22352 brings a name you can trust with some great features. When the name Kenmore comes in our mind, the only thing we think about is top-notch household appliances; and the Kenmore 22352 Washing Machine lives up to that. Its wash capacity is a huge 4.2 cu. ft. that can take care of the laundry needs of a large family. 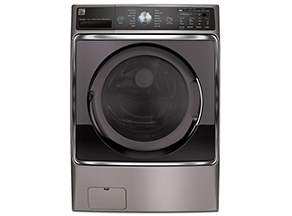 But Kenmore also offers this top load washer with 5 other wash capacities: 4.7 cu. ft., 4.8 cu. ft., Elite 5.2 cu. ft., 5.3 cu. ft. and Elite 6.2 cu. ft. That means Kenmore is there even for those who are looking for top-class commercial washing machines. There are 5 rotary knobs: Soil Level, Wash Temp, Water Level, Rinse and Wash whereas the Wash knob has 12 different cycles. It doesn’t come with a steam or aqua jet cycle but it has enough to take care of any user’s needs. In terms of look, it is not aesthetic at all but it gets the job done pretty well. We found Kenmore 22352 very effective in stain removal and it is extra gentle on clothes though it belongs to the agitator type. It also has a fabric softener dispenser system for user convenience. Storing it is easy and being stackable, it can help one save space in congested places. Its cycle end signal is another great feature that frees the user from waiting for the wash cycle to end. Such feature-rich products usually come at a high price, which is true in this case as well. You have to pay close to $300 for this unit and it comes with a 13-month warranty period. The one we tested came with a warranty for 1 year though, so we guess the warranty period varies from one seller to another. Between the two high-priced, top-class Kenmore washer models in our Top 10 Washers List, this one has lesser number of features as well as Amazon rating. 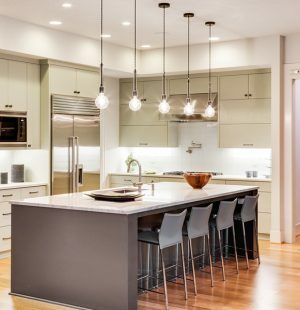 Its monotonous look is a turn-off for the stylish users and could even reduce the beauty of an amazing indoor décor. But in terms of usability and functionality, it is a choice worth making – the reason why it was able to take place in our Top Rated Washing Machines List. Another DELLA on the list, this compact washer provides an option that saves huge amounts of space while still delivering a brilliant performance, made of stainless steel, it will give a great performance for years to come too. As a portable and compact washing machine, this DELLA product has comparatively larger wash and spin capacities than its counterparts, 8.8 and 4.4 respectively to be precise. We didn’t like the fact that DELLA washing machines’ spin capacities are usually much smaller than their wash capacities, often requiring 2-3 more spin cycles per load. It has 3 rotary knobs for the wash and spin cycles as well as the timer. We noticed the hose it came with did not support the kitchen sink we tried to connect it to, so we had to purchase an adapter. However, you can use a bucket for the same purpose. 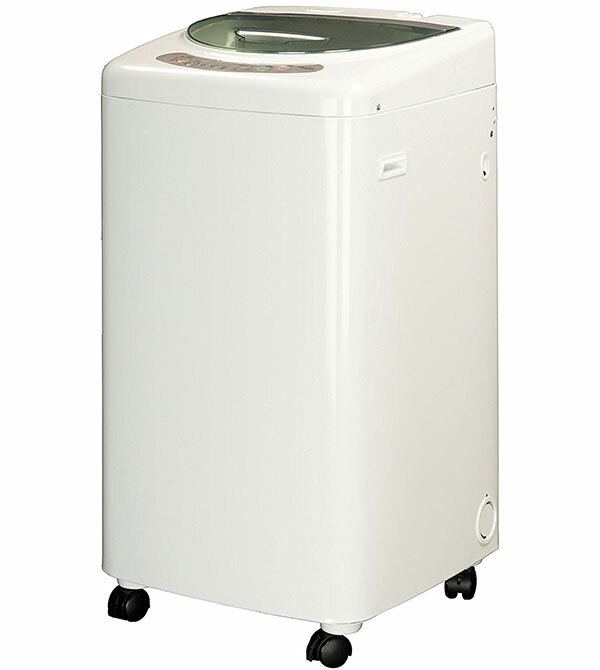 DELLA Mini Washing Machine is simple to use and easy to carry around. We would suggest that the user should not overload the washer when using the spin cycle because it could otherwise hamper its performance. With a long 2-year warranty, it costs a bit under $100 that seems reasonable for a compact washer with a built-in pump. It may be the last option in this list, but that doesn’t make it a worthless product. In fact, it’s rated 4 on Amazon, which means users found it worth the purchase. Being made of stainless steel, it will last for years and the user will get the value of every penny spent on this washing machine. You should clean your washing machine every once in a while to avoid foul smells and prevent mold and mildew. You can do some easy things which will make an immense difference in decreasing the chance of your washer getting out of order. You got your washing machine by paying a large amount of money, so you will definitely want it to last long. If there are odors and your clothes are not cleaned well, maybe it’s time to wash your washing machine itself. Check water hoses every month for fraying, cracking, leaks and bulging. You need to replace them if any problem occurs. Remember to have at least 4 inches space between the wall and your washer. This will help prevent any kinking of hoses. Don’t load your washer beyond its capacity because overloading will be damaging for it and reduce its lifetime. An unevenly placed washer can rock, vibrate, or “move” on the floor during the spin cycle, which can harm the machine or the floor. You can turn its legs in a clockwise direction to lower the machine and then turn them counterclockwise to raise the level. It depends on the model of your washer though. Any soap residue inside the washer should be rinsed away. You can use a washing machine cleaner or a mixture of vinegar, baking soda and hot water through the empty load for this purpose. Cleaning the cord filter as well will allow the unit to work effectively. Keep the lid or door open for some time after every wash cycle to keep it dry and let it smell fresh. You should carefully read the instruction manual of the washer for this purpose. Otherwise, your machine could be damaged. You can do it in case you own a top loader because water leakage could damage the floor below the washer. The Future of Washing Machines: What to Look forward to? Smart washing machines are a possibility now since people from all around the globe are working hard to upgrade the regular washing machines. Now it’s up to you to decide whether you want to cut their running cost, wash more efficiently, and enjoy more features and functionality. Innova Steam Washer Dryer was a washer-dryer concept that won the prestigious Red Dot Award: Design Concept in 2013. This was designed because the originators thought it was unnecessary to use so much water per load of clothes when they could be steam cleaned. This can be regarded as a pioneer of future washers that attracted everyone with its shining steel look, minimum design and water saving feature. Innova promised to use much less water than the regular washers and its steam for both sterilizing clothes and for making them convenient for ironing. They used such technology in the washer where it heated the drum and the vaporized water was then released through the machine’s ventilation grills for effective drying. There was also a removable ‘fragrance box’ that could deliver scent into its drum using the steam. Alex Cabunoc, a design student from California, and his team wanted to make washing of clothes cheaper and quicker for people living in the third world countries and so they began researching on it. After their study on the laundry habits of Peruvians, they designed a 100% non-electric washer, namely the GiraDora. It looked like a small drum with a cushion so that users could sit on the top of the washer. The clothes were agitated and spun inside the drum with the help of a pedal. The basic mechanism of the top loader was used in this machine and it was portable, easy to use and could save water. Due to having such awesome features, the GiraDora won a Red Dot award in 2012. This machine was a nice example depicting that innovation could benefit the lucky as well as the needy. Suppose you need to leave your home for office but you have loaded your washer with dirty clothes and now you cannot finish the cleaning process in the next 30 minutes or so. Well, you don’t need to worry about anything since you can finish the process by texting your machine. LG launched the homechat app at CES in the year 2014 through which you can instruct your washer according to your requirements, and our advanced pick Kenmore Elite 41073 already has it! Such time management applications will be a common thing for washing machines in near future. Washing machines are getting smarter with the advancement of science and technology. Just wait to see what the future has in store for them! As you can see, we at Stuffoholics spent a significant amount of time and gave a lot of effort to provide you with a reliable list of the top rated washing machines available with a research report so as to help you make up your mind in case you’re not sure which one to choose from so many options out there. Our effort will come to fruition only if you’ve found it useful and informative. Please get in touch with us if you need further information and see our other reviewed and tested products we prepared specifically for our valued audience, including you!